Power does not change its forms as much as we think. Whether it is a state which controls vast resources and populations or a state which has shrunk to the level of the city or the village, the means of exercising power and its problems are often similar. A state has to use levers to exert force- the image is exact because the order of a single politician has little to no power, it is the way that that is converted into the actions of hundreds, thousands or millions that is the key to his power. The Third Reich in that sense is an interesting example of what a state can do- insane and destructive policies which led to hideous human rights abuses and the holocaust, not to mention the destruction of Germany and much of Europe in the bloodiest war ever seen. Amongst the central issues anyone has to confront when they look at Hitler's regime is how such insanity- and such unstable clowns- came to govern a civilised and educated state for 12 years and become intensely popular, not merely in Germany but also abroad. How did they exert that influence- what kind of levers did they pull? The answers to that are vast- they swallow things like ancient anti-semitism and modern economic crisis. Amongst the reasons that the Reich was able to exert such power was that its leaders were able to use traditional resources within German society. They wooed and won the Princely and aristocratic classes of the German state- more Princely scions supported the Nazis than any other group save for doctors. The reasons why these people supported the Nazis are dealt with in Christopher Clark's illuminating review of Fabrice d'Almeida's new study of the Nazis and High Society. What he shows is that Hitler and Goring in particular created the image of a court- they surrounded themselves with aristocrats and attempted to attract them (especially after the war) through the acquisition of art and antiques. Hitler was invited to salons as an outsider whose peculiarity and uncouth manners were part of his attraction. 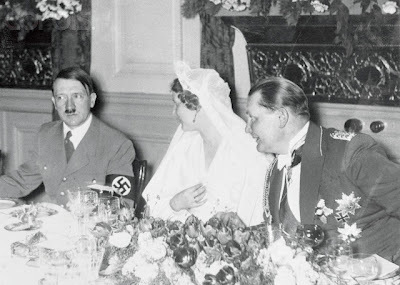 As we get into the thirties, the Nazis made it very clear that they were willing to give the traditional elites access- Goring's marriage in 1935 for example was attended by at least 63 Noblemen and women. The Nazi elite were keen to burnish their cultural credentials as well- both using these to offer access- Ribentrop invited 2000 guests to an Olympic party in 1936 but also creating a gift culture within organs of the Nazi state. So for example the Nazis collected massive amounts of art- especially after the conquest of France in 1940 which they distributed onwards to their friends and allies. Generals and princes received paintings and monetary rewards to buy their silence. What we see in part within the Nazi regime is the manipulation of very old methods to govern the state: governing through display and through patronage and of course through old elites. Officers within the Wehrmaht and the SS were disproportionately from the noble classes- this gave the regime legitimacy in the eyes of conservative Germans as well as creating the image of the Nazi party as guardians of European civilisation against communism. Courtliness served the cause of Hitler just as demagoguery on the streets of Thuringa helped him. As Chris Clark notes, we have neglected for too long the appeal that Hitler had to German elites, this means that we do not neccessarily appreciate the sources of the power of Hitler's despicable regime: one of those sources was Hitler's popularity with the masses, another was Hitler's popularity with their masters. Art and snobbery burnished the reputation of the Nazi regime within and without and helped serve them in controlling Germany and leading it and Europe into disaster, atrocity and war. what's the basis of this supported-is it members ? were the aristocracy more likely to be members of a political party in general particualry the DVP (or indeed doctors) how much of this is was extra support as opposed to extra party membership? also after the attmepted coup is it true Hilter breaks the artistocratic domiannce of the German army or is that myth?